Blueberries and strawberries, in particular, have recently been highlighted by Harvard researchers as ‘superfoods’ for heart health. Fruit can be immensely beneficial to your health, as it’s a natural source of fiber, vitamins and antioxidants. But it also contains fructose, the metabolism of which causes most of the same toxic effects as ethanol, such as visceral adiposity (belly fat), insulin resistance and metabolic syndrome. When consumed excessively, fructose may actually be more damaging to your health than alcohol, having over 70 documented adverse effects . An appropriate amount of fructose is no more than 25 grams per day, but if you’re overweight or at risk of (or have) heart disease, cancer, or type 2 diabetes, then you’re probably better off cutting that down to 10-15 grams per day, including the fructose that comes from fruit. Another way to determine just how strict you need to be in regard to fruit consumption is to check your uric acid levels. If your levels are outside the healthy ranges listed above, then I strongly suggest you listen to your body’s biochemical feedback and reduce your fructose consumption, including that from fruit, until your uric acid levels normalize. I’ve also included a chart below of fructose levels in fruit to give you an idea of what 25 grams of fructose a day looks like. If your fruit consumption only consists of apples, oranges and bananas, you’re missing out on some of the healthiest fruits out there! 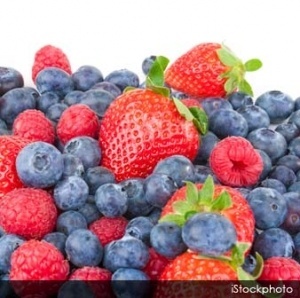 Blueberries, strawberries, raspberries, blackberries, cranberries… unless you overeat them, it is hard to go wrong with berries, as they contain powerful phytochemicals such as ellagic acid that provide antioxidant protection, as well as directly inhibit the DNA binding of certain carcinogens. Berries are also excellent sources of vitamin C, carotenes, zinc, potassium, iron, calcium and magnesium; they’re high in fiber and low in sugar. Like berries, watermelon is loaded with phytochemicals, including lycopene, beta-carotene, and citrulline. When citrulline is consumed, it is converted to arginine. Arginine is an amino acid that has beneficial effects on your heart and circulatory system, as well as your immune system. Arginine boosts nitric oxide, which relaxes blood vessels, leading to another beneficial side benefit of watermelon… a Viagra-like effect without the hazards of a toxic drug! Arginine also helps the urea cycle by removing ammonia and other toxic compounds from your body. The primary source of this fruit’s benefits is its antioxidant content, particularly ellagitannin compounds like punicalagins and punicalins, which account for about half of the pomegranate’s antioxidant ability . The juice and pulp of pomegranates have previously been studied for their potential heart- and joint-health benefits. Rich in antioxidants like carotenes, vitamin C and flavonoids, papaya is also useful for digestion, as it contains papain, an enzyme that helps with digestion by breaking down proteins. Papaya also has plant compounds that support your immune system, provide anti-inflammatory effects and may provide protection against cancer. It’s also a rich source of minerals, potassium and magnesium. Pineapple contains an enzyme, bromelain, which aids digestion, reduces inflammation and swelling and may have anti-cancer effects . Rich in antioxidants like vitamin C, pineapple also provides immune support and is an excellent source of manganese, thiamin and riboflavin, which are important for energy production. Cherries contain powerful compounds like anthocyanins and bioflavonoids, which are known to fight inflammation and may help lower your uric acid levels and risk of gout . Bioflavonoids in cherries may reduce the activity of the enzymes Cyclooxyygenase-1 and – 2, which helps to reduce inflammatory processes associated with arthritis and gout in the body. Queritrin – a flavonoid – is also rich in cherries, and has been found to be a potent anticancer agent. Cherries also contain ellagic acid, a naturally occurring plant phenolic known as an anti-carcinogenic/anti-mutagenic compound.